Previously, there were no car specific properties – only general product details could be expressed. Now, there are about 25 properties that can express various vehicle specification details supported with several dedicated concepts describing in details i.e. engine. 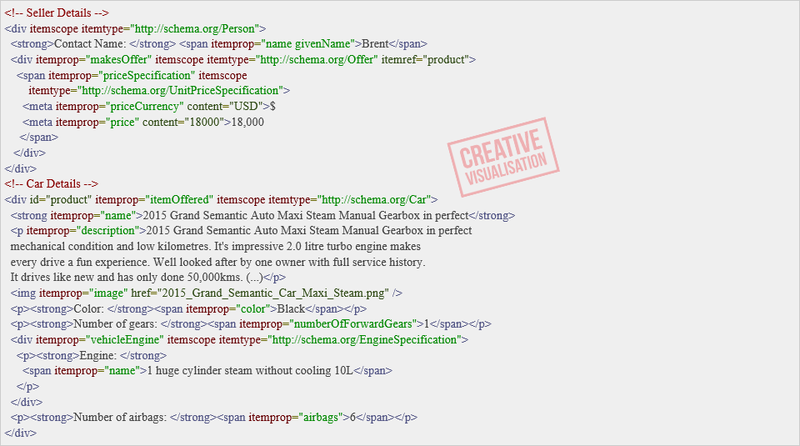 In conjunction with the fact, that Schema.org is also extended with so called property-values, it is possible to provide a generic descriptions of all the vehicle elements that does not fit into any of the specific properties like equipment! Please note that several properties are described quite extensively. * Creative visualization for demonstration purposes only.